Like journalists, opinion writers, and TV newscasters and commentators, political cartoonists were quick to respond to the Green New Deal (GND) climate change initiative put out in early February by two liberal northeastern Democrats in the U.S. Senate and House of Representatives. But there were striking differences in willingness to engage the issue, depending on the political leaning of the respondents and the mediums in which they were working. Written analyses and commentaries, left and right, were roughly equal in number. In pieces published in a range of outlets, from AP to Vice, liberal commentators praised the plan for its bold vision even as some questioned specific details. Conservative commentators, published mostly in venues on the right (Federalist, Townhall, Washington Examiner, Washington Times) mocked what they saw as the plans’ unrealistic goals, warned about its supposed socialist underpinnings, or in some cases even thanked Democrats for embracing a plan so absurd that it just might increase chances of a Trump re-election in 2020 and decrease the odds that Democrats take back the Senate. But the imbalance between the left and right among political cartoonists was even more striking. In the first 10 days after the Green New Deal was announced, right-leaning artists published nearly five times as many cartoons as their more numerous left-leaning colleagues. This count was determined by examining all the left- and right-leaning cartoons posted at Gocomics.com between February 5, when news of the GND announcement was leaked, and February 17. The same dates were used to define a review of cartoons posted at the website of the socially conservative Townhall. Together the two sites offered six GND cartoons posted by the 27 left-leaning cartoonists whose work is archived at Gocomics.com, and 28 cartoons posted by 19 right-leaning cartoonists (13 whose work is archived at Gocomics.com and another six whose work was archived by Townhall.com). the “green” plan will advance what they see as liberals’ long-standing “socialist” agenda. 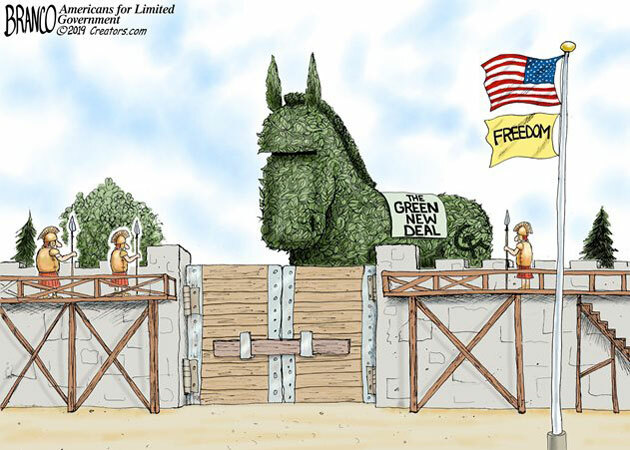 The third point, about liberals’ putative socialist agenda, is made most directly by AF Branco’s February 5 cartoon, drawn in anticipation of the February 7 announcement, depicting the GND as a Trojan Horse. To ensure that readers grasp his literary allusion, Branco brands the green horse with a Soviet sickle and hammer and adds a banner for “Freedom” below the American flag waving over the guarded walls. Most of Branco’s conservative colleagues chose to deliver more subtle messages and leavened them with more humor, even whimsy. Nearly two-thirds included a reference or depiction of AOC, often in comic scenes with cows. 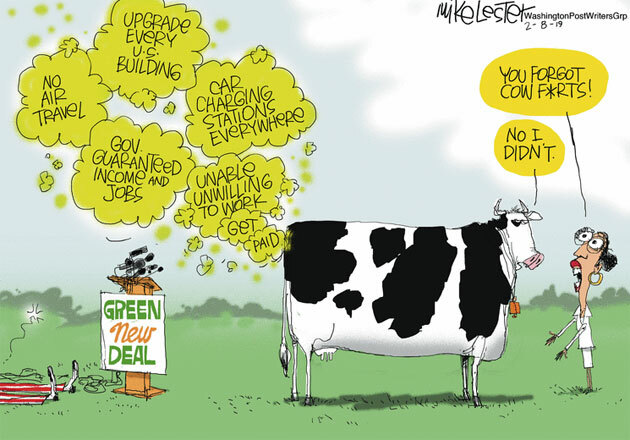 Mike Lester, in the cartoon posted the day after the GND announcement, depicts AOC admonishing a cow for not controlling its emissions. He then uses the cow farts, which have knocked out Uncle Sam, to highlight the measures he thinks conservatives will find most objectionable. 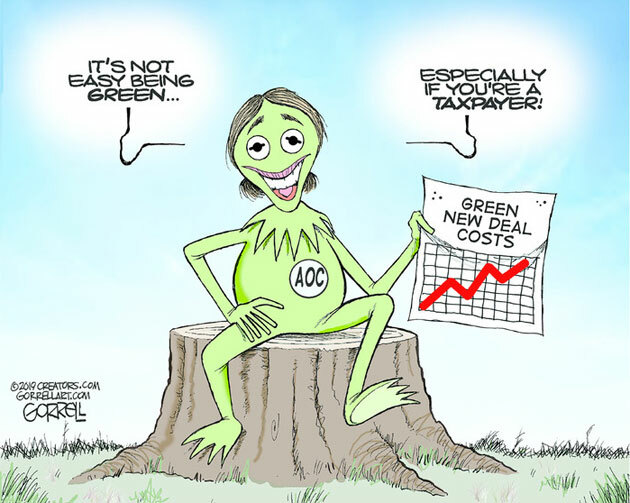 In Bob Gorrell’s February 12 cartoon, shown below, AOC is depicted as the Muppet, and the discomfort of being green is transferred to the taxpayer. Other cartoonists, on both the right and the left, used unicorns to signify what they perceived to be the fanciful ambitions of the GND. “Who needs airplanes and cow toots when you can have unicorns and rainbows,” exclaims the AOC astride the flying unicorn in Nate Beeler’s February 12 cartoon. The clearly concerned Democrat-donkey riding with her seems oblivious. 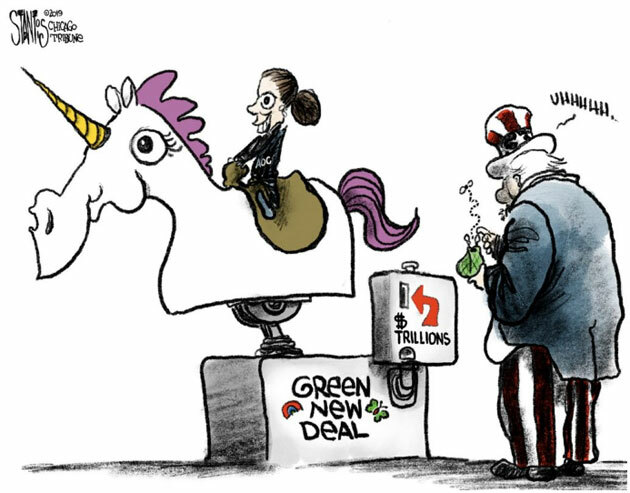 In the Scott Stantis cartoon from February 12, AOC is shown riding a mechanical unicorn, like the rocking horse rides one used to find near the entrances of big department stores. Uncle Sam searches through his coin purse for the “trillions” needed to make the GND operate. Left-leaning artist Matt Davies, does not really dispute the GOP’s characterization of the GND as “the stuff of fantasy.” He just compares it to the equally fanciful belief, in the view of most Democrats, that “tax cuts pay for themselves,” which he represents with a framed picture of a unicorn on the wall behind a GOP operative reading a newspaper account of the GND. Before turning to the more vigorous rejoinders offered by cartoonists on the left, it is worth noting that none of the cartoons from right-leaning artists depict any impacts from climate change – or, for that matter and despite the February timing, even wearing winter clothes . In those showing an outdoor scene, the sky is blue and the clouds white and friendly. 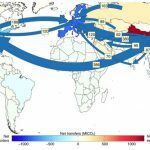 There are no droughts, no floods, no heat-waves, no record-breaking storms or wildfires. Instead the artists offer images of stranded high-speed rail trains, Amish buggies, paddy wagons operated by “flatulence police,” and, yes, cows, kermits, unicorns, and AOC. Ironically, only two of these February cartoons depict snow or people in winter wear. 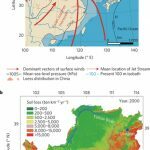 An unconscious admission that global warming is already occurring? Toles’ second take on the furor surrounding the GND, published on February 14, focuses on Republican Senate Majority Leader Mitch McConnell of Kentucky, who is also the subject of a February 14 cartoon by Chan Lowe. 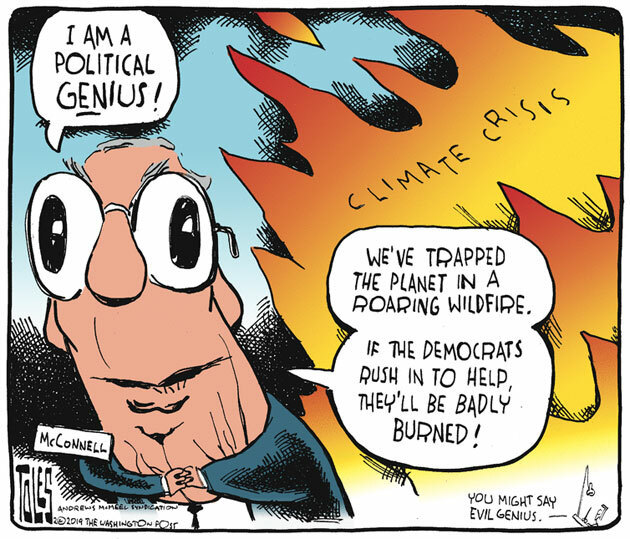 Both cartoonists highlight McConnell’s cynicism in using the climate crisis to wound Democrats – the first responders in this moment – politically. Granted, those first few weeks of February offered left-leaning cartoonists several other targets for their satire, notably President Trump’s border wall proposals and “national emergency” declaration, budget negotiations to avoid a second government shutdown, and the President’s bizarre and rambling February 16 White House Rose Garden press conference. One is left to wonder which set of cartoonists’ GND pieces – those supporting, or those opposing, the initiative – reached larger audiences or had more impact. 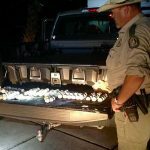 But in terms of quantity of cartoons alone, the imbalance is clear, and those supporting appear to have been badly outnumbered by those criticizing.